Sibling relationships can be very meaningful and ********, but it is common for people to drift apart as they grow older and build their own families and other relationships. Distance can also make it harder to maintain supportive sibling relationships, but you can still maintain them with some effort. Even if you are not super close to your sibling, they will often end up being lifelong and important. As a person with siblings, you may wonder how you can support and care for your sibling. 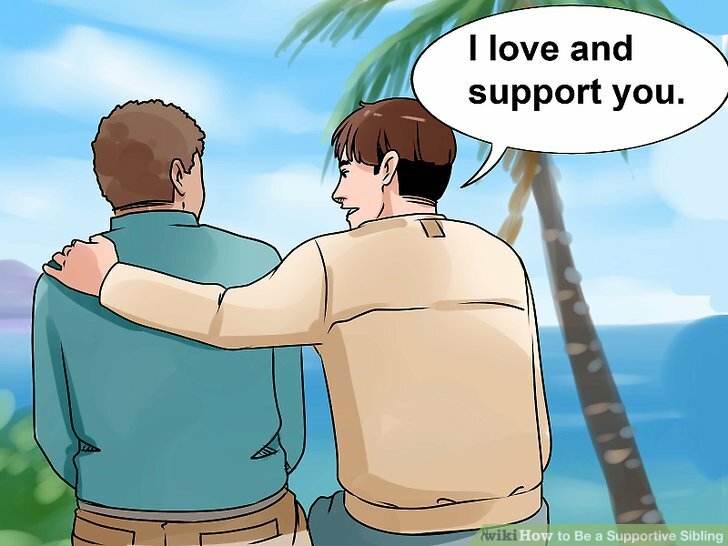 You can be supportive by communicating effectively with them and by being there for them during difficult times. 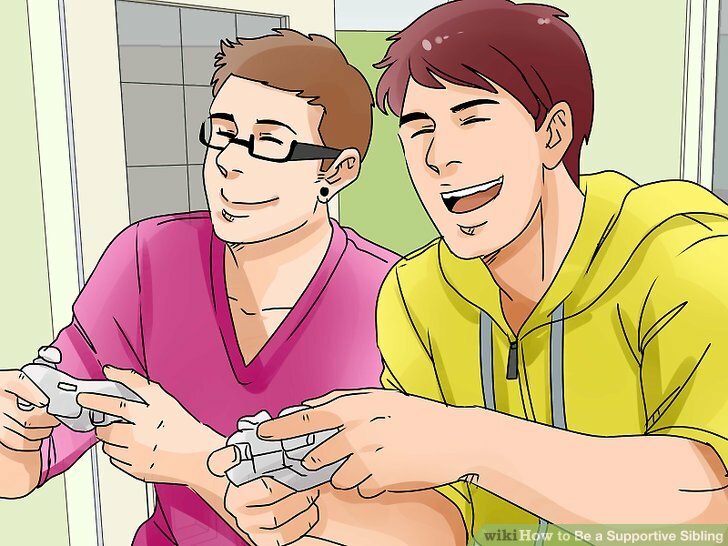 You can also try to get along well with your sibling so you can both enjoy each other’s company and support each other. Contact them on a regular basis. 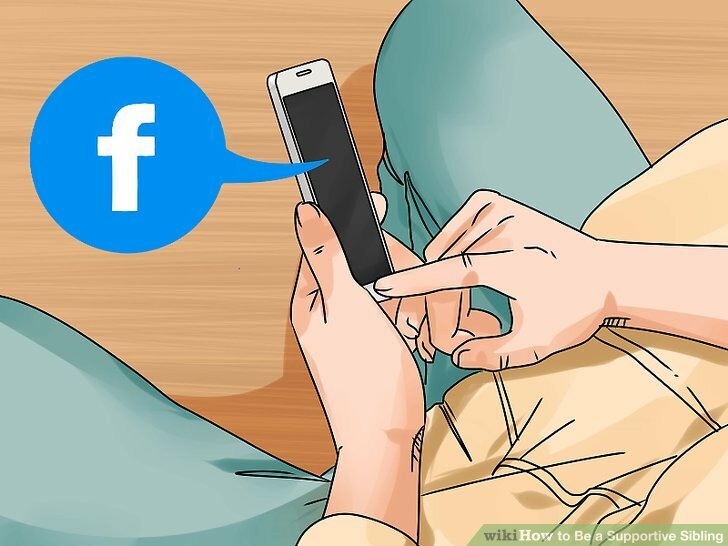 If your sibling is going through a difficult time, such as a break up, the loss of a friend, or the loss of their job, stay in touch with them on a regular basis. Call them or text them daily with a friendly, “How are you?” or “How’s it going?” Send them funny videos or images to cheer them up, especially if you know they are not feeling great. Staying in contact with your sibling will let them know that you care about them and that you are there for them. Even a quick message once a day can make them feel supported and less alone. Have weekly lunch or dinner plans. To be there for your sibling, set up weekly plans where you get together face to face and catch up. Try to schedule regular weekly lunches or dinners with your sibling and commit to them. Having quality one on one time with your sibling can make your bond stronger and make them feel you are supporting them. You may have your sibling over for dinner at your home or switch between their home and your home. You can also suggest meeting for lunch at a place you both like so the environment feels comforting. Offer to help them with chores or other commitments. If your sibling appears overwhelmed due to stress or anxiety, give them a helping hand. Help them do chores they do not have the time or energy to do. Offer to help them complete tasks and commitments so they have time for themselves to relax and unwind. 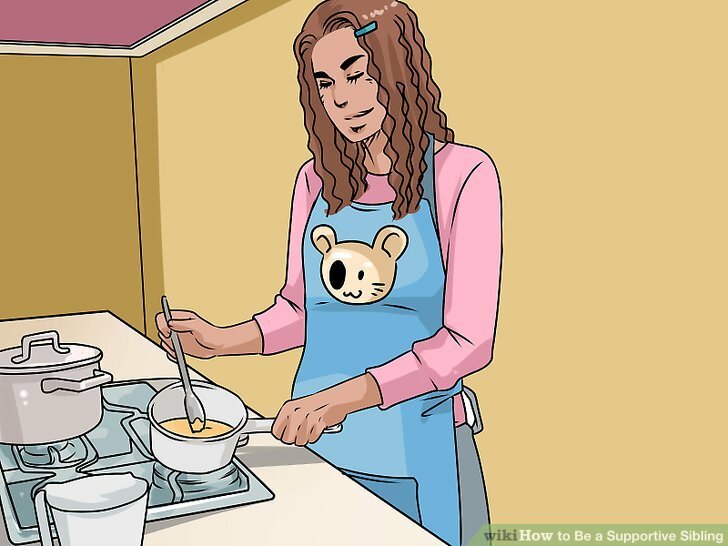 For example, if your sibling is not able to prepare their own meals due to an illness, bring them take out or prepare home cooked meals for them. Suggest they speak to a professional. If your sibling is struggling with their mental and physical health, you may suggest that they speak to a counselor or a therapist. Part of supporting your sibling is being honest with them and letting them know you are worried or concerned about them. 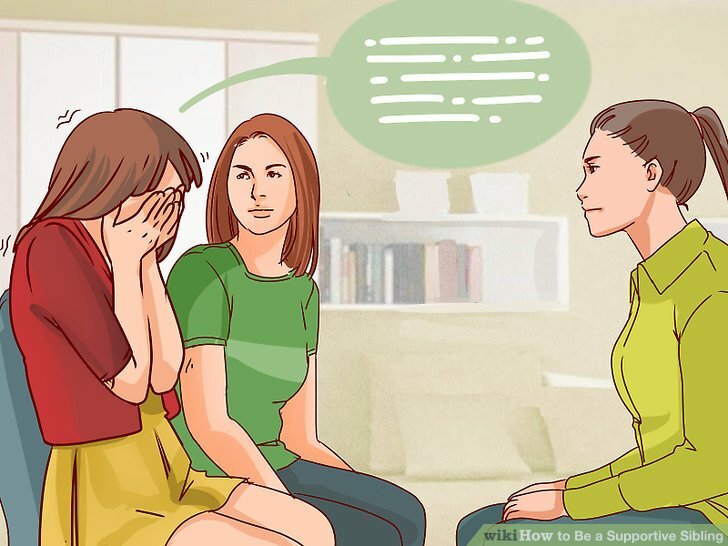 They may need help beyond what you can provide as a sibling and a professional therapist or counselor may be the right answer. You may contact a mental health clinic nearby to see if there is a counselor your sibling could speak to. If your sibling lives on campus or goes to school, you can suggest that they speak to a school counselor. Share your feelings with your sibling. A big part of being supportive of your sibling is making sure you are honest and share your feelings with them. Don’t be shy about sharing how you are feeling. Tell your sibling when you are feeling emotional and be honest with them. Use “I” statements when you express your feelings. Be a good listener. Support your sibling by being a good listener, so they feel they can confide in you. Maintain eye contact with your sibling and nod as they speak to show them you are listening. Avoid interrupting them and wait until they are done speaking to ask them thoughtful questions. Try to practice active listening, where you listen to your sibling speak without interruption. Then, once they are done, respond by repeating back what they said to you. You may say, “What I’m hearing you say is…” or “What I think you meant is…”. Once they have confirmed you heard them correctly, you can respond to them. 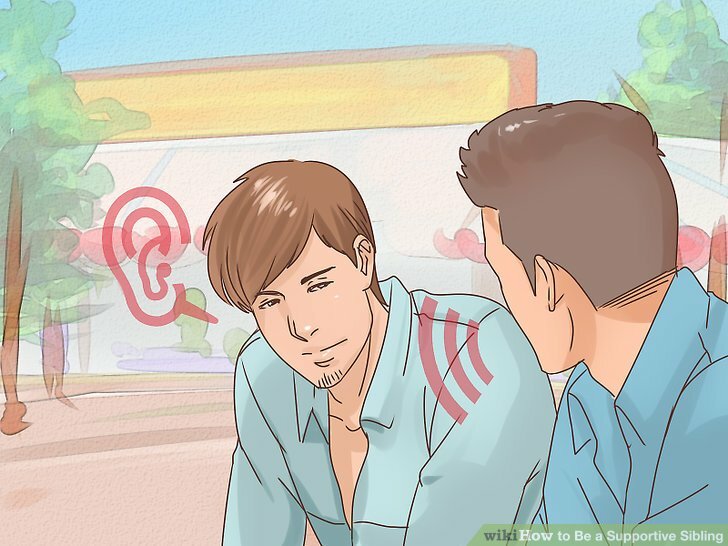 Doing active listening will ensure you are both communicating effectively with one another and listening to each other closely. Offer guidance and advice. 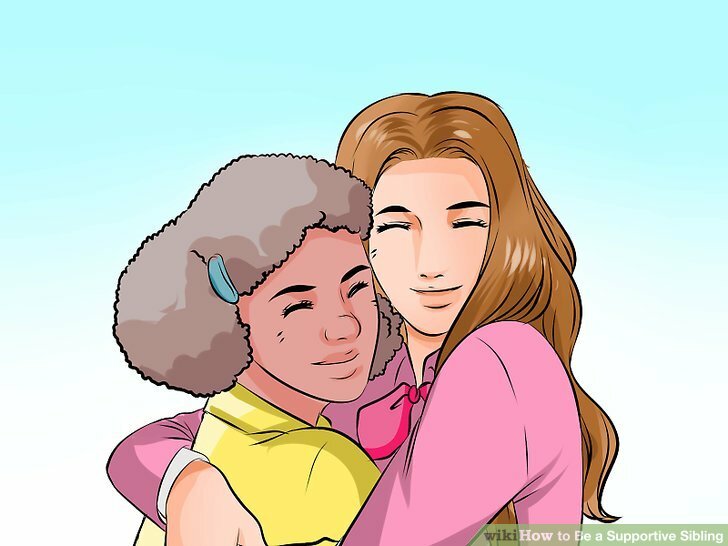 If your sibling confides a problem or issue to you, try to offer guidance and advice. Listen to what they have to say first and then ask them thoughtful questions. Wait for your sibling to ask for your opinion or for advice before you give it. 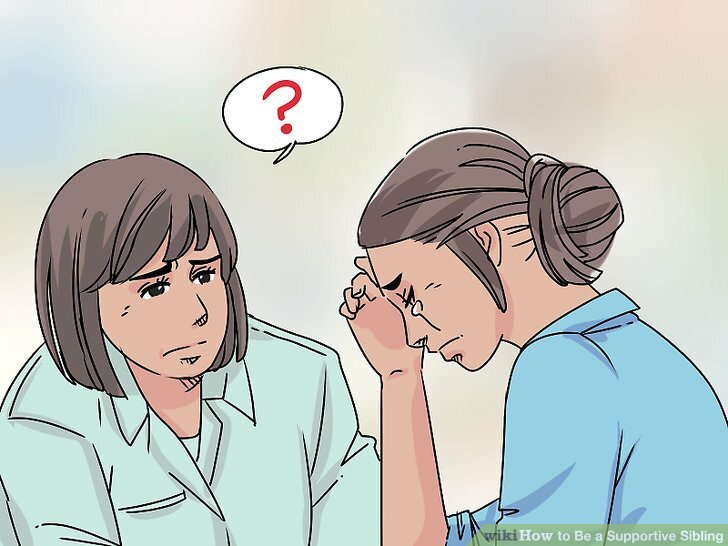 Make suggestions, offer advice, but do not pressure your sibling to take your advice. Ultimately, they are their own person and should make their decisions on their own. 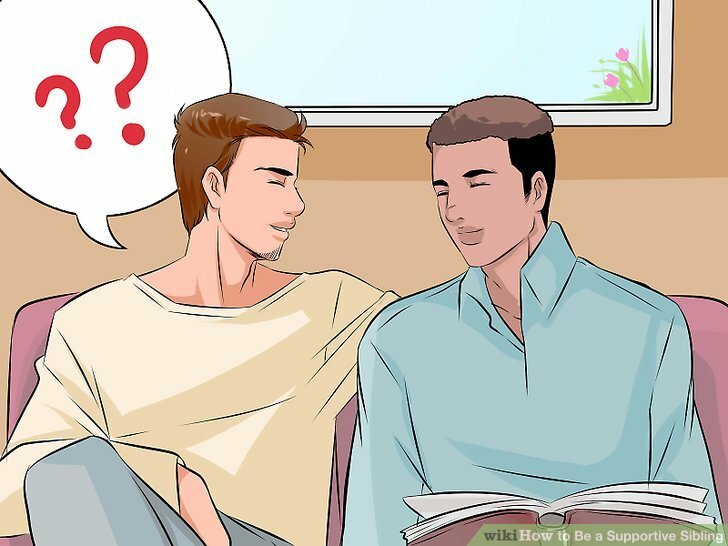 For example, you may offer advice to your sibling by saying, “In my opinion…” or “My advice is to…”. Avoid conflicts and arguments with your sibling. Sibling rivalry is common and this can often lead to fighting and arguing. Support your sibling by trying to get along with them. Avoid petty arguments and fights. Use your communication s****s to mediate any issues you might have with your sibling. Take a time out if you get upset. Step away from the conversation and take a five-minute time out where you go off on your own to calm down and think. Then, return and start the conversation again with your sibling in a more relaxed manner. Support your sibling if they have a conflict with your family. Sometimes siblings can be divided when one sibling sides with one parent or with other relatives. 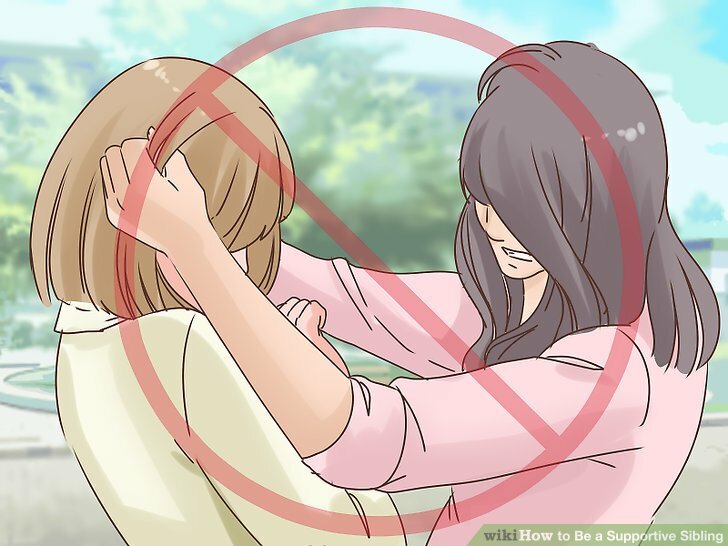 Try to support your sibling when they are in a conflict with a family member, even if you may not agree with their choice. Listen to their concerns and remind them that you love and care for them, despite the conflicts in the family. For example, you may say to your sibling, "I don't agree with you siding with mom on this issue. But I want you to know that I love and care for you. I will support you." Try a new hobby or activity together. 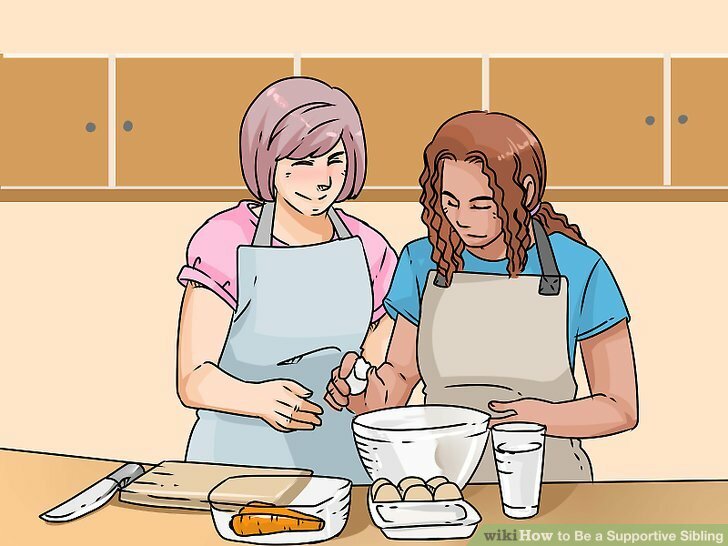 Support your sibling by doing a new hobby or activity together. This way you can both bond and feel acknowledged. Having a hobby or activity in common can help you and your sibling bond. It will also allow you to both support each other and recognize each other’s accomplishments. Take a fitness class, a craft class, or a cooking class together. Try a new hobby like knitting, painting, or tackle a new video game. Spend quality time with your sibling. Make sure you devote a portion of your schedule to spending quality time with your sibling. Have a meaningful conversation over lunch. Spend time doing a fun activity together, like preparing a meal, listening to music, or going for a walk. Having regular quality time with your sibling will take time and effort, but this will help to maintain your relationship. If you and your sibling both have your own families, then plan family outings together and make time for family get-togethers. Stay in contact with your nieces and nephews. If you have nieces and nephews, then be a good uncle/aunt by keeping regular contact with them. You can also involve your other family members and spend time together as a family. Doing this can make you all feel supported and loved. Your sibling may also feel they can lean on their other family members, as well as you. Plan a trip to visit your sibling once per year if they live far away.